Ireland U20’s announced for French opener. You are at:Home»Ireland»Ireland U20»U20 Six Nations»Ireland U20’s announced for French opener. 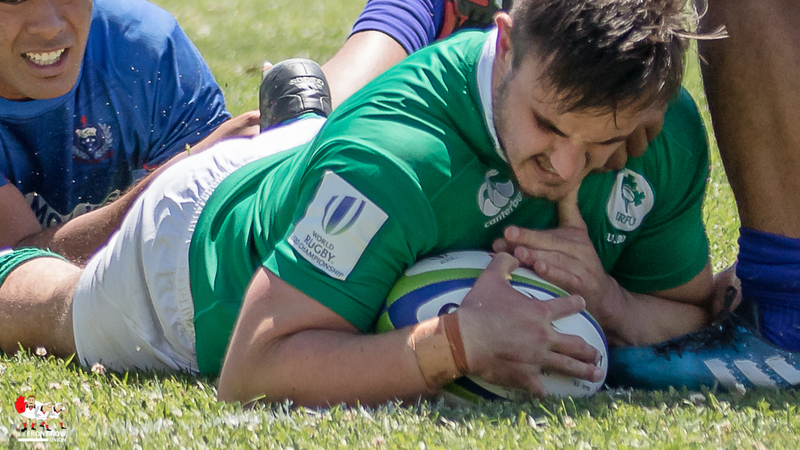 Michael Silvester in action for Ireland U20s against Scotland. The Ireland U20’s Match Day 23 to face France U20’s in Bordeaux on Friday night was announced earlier this afternoon. The good news is there are six Ulster lads in the squad with Jonny Stewart starting at scrum half, and Matthew Dalton and Aaron Hall starting at 6 and 7 respectively. Prop Tom O’Toole gets some reward for recent outstanding performances for Ulster A with a place on the bench and exciting out half Angus Curtis and utility back Angus Kernohan complete Ulster’s representation from the bench. It’s going to be an interesting tournament for the U20’s who are coached by Noel McNamara for the first time. McNamara has big boots to fill, in our opinion, as previous incumbent Nigel Carolin did a fantastic job during his tenure before being lured away by Connacht at the end of last season. Carolin always tried to get his charges to play rugby and he showed commendable loyalty to his players. More often than not this loyalty was paid back in spades, Ulsters Johnny McPhillips being one such player to shine after a mixed start to his representative career. There are a few names we’ve still to get familiar with but th back line is topped and tailed by two highly rated players in Leinster’s Michael Silvester (pictured above) at full back and Ulster’s Jonny Stewart at scrum half. A lot of Ireland’s go forward will probably rely on the silky running of Silvester, who impressed in last seasons U20 World Championship in Georgia, as the bulk of the back line look more defensively solid rather than attacking. Certainly, returning players Tommy O’Brien (captain) and David McCarthy looked to base their game on an abrasive defence last season in the U20 Championship, but that was in a much decimated squad with an interim management team. In fairness, they did finish the tournament strongly after a difficult time in their pool. At the moment we don’t know much about Peter Sullivan, James McCarthy or Harry Byrne but they will be more than ably guided by the colossily experienced Stewart who, as well as being a linch pin for Ulster A this season, has added a senior Ulster cap to his experience. Ulster supporters might get an early look at a future senior half back pairing if Angus Curtis makes an appearance from the bench, Curtis being another youngster that we rate highly at FRU Towers. Now, in fairness, he only managed 10 minutes against Scotland in the U20’s Championship before leaving the competition due to concussion, but in that time he looked the complete package and created two tries. Curtis and, his Ulster colleague, Angus Kernohan both have the ability to bring something different off the bench. At a time when the Ulster management teams are getting a bit of a slagging it is worth pointing out the excellent work by Kieran Campbell and Willie Anderson in getting six Ulster youngsters into the first U20 match day squad and I expect it to go up to eight as the season progresses. Again, we know little about the rest of the new boys in the pack but the Ulster wing forward pairing of Dalton and Hall have used their experience in the British and Irish Cup to mature into hugely impressive players throughout that tournament. The Ulster A Management team of Kieran Campbell and Willie Anderson obviously take some of the credit here but it’s also worth mentioning the great work that Pete Browne and, in particular, Clive Ross have put in with the A team this season to help bring these youngsters along. So plenty to get excited about as these players begin their journey towards the 2018 U20 Championship, which will also be in France. I’m not expecting them to come away with a win in this one but I’m looking forward to seeing how they play. Ireland U20: Michael Silvester, Peter Sullivan, David McCarthy, Tommy O’Brien (c), James McCarthy, Harry Byrne, Jonny Stewart, Jordan Duggan, Ronan Kelleher, Jack Aungier, Cormac Daly, Jack Dunne, Matthew Dalton, Aaron Hall, Jack O’Sullivan. Replacements: Diarmuid Barron, James French, Tom O’Toole, Ronan Coffey, Sean Masterson, Hugh O’Sullivan, Angus Curtis, Angus Kernohan.